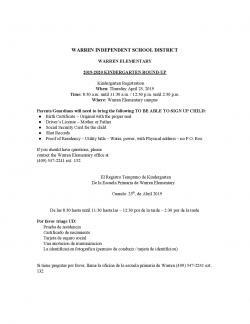 Hello Warren Elementary friends and family. My name is Robyn Glosson and I am the principal at Warren Elementary. I look forward to working with the wonderful elementary faculty, parents, and community to provide a safe, orderly learning environment for the children of Warren ISD. Please keep an eye out for a few announcements over the next couple of weeks on Facebook and our webpage for changes to any procedures or any additional information that may be relevant to the start of school. 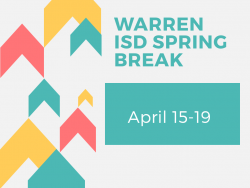 If you have any questions, please contact me at the school or email me at robyn.glosson@warrenisd.net. School Hours – 8:00-3:30. Tardy bell rings at 7:55. Please have your students to school before 7:45 so they may eat breakfast. We will release car riders starting at 3:10 and buses will run starting at 3:30. If your child does not ride the bus in the morning please drop them off in the car line in front of the school. We have plenty of people on duty to ensure that your child will make it to his/her classroom. This is for the safety of all the children on campus. If you have any questions or concerns please feel free to contact Mrs. Glosson at the school. Thank you for your cooperation and understanding with this matter. 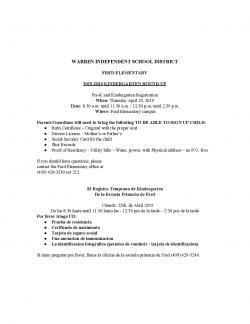 Warren Elementary will have full day pre kindergarten beginning August, 2016. Pre-k is only funded for qualifying students based on income. Students who do not qualify will be allowed to sign up for available remaining slots on a paid basis. These students will be accepted on a first come, first serve basis. Click on the link to access the informational packet.